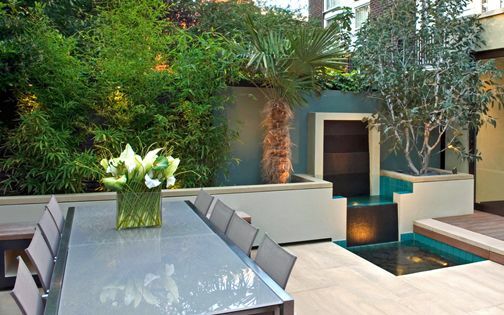 This Primrose Hill patio garden was transformed from an unrealised stretch of plain grass to a minimalist, cohesive space, and evolved into the most exciting room of its residence. We Improved usability with verdant seclusion, and infused an integral connection to the architectural fabric of this North London home, where the new patio garden design created an intimate, functional space, imbuing family fun, alongside a revamped front garden and a modern roof terrace. 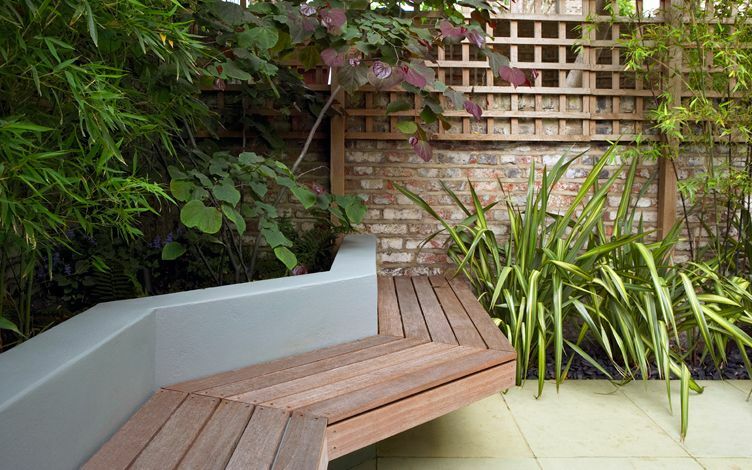 A retaining wall was situated close to a conservatory, where we carved out further space to expand the lower patio. 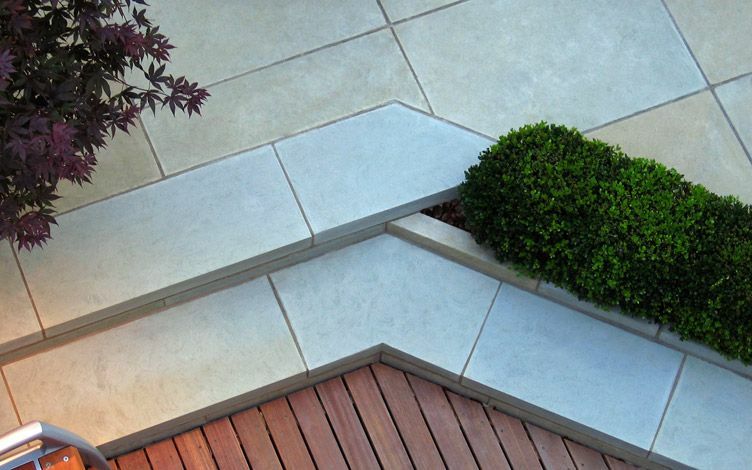 Distinctly buff and blue, the 900 x 600mm sandstone pavers originate in Yorkshire, and display delicate veining with a 75mm profile. 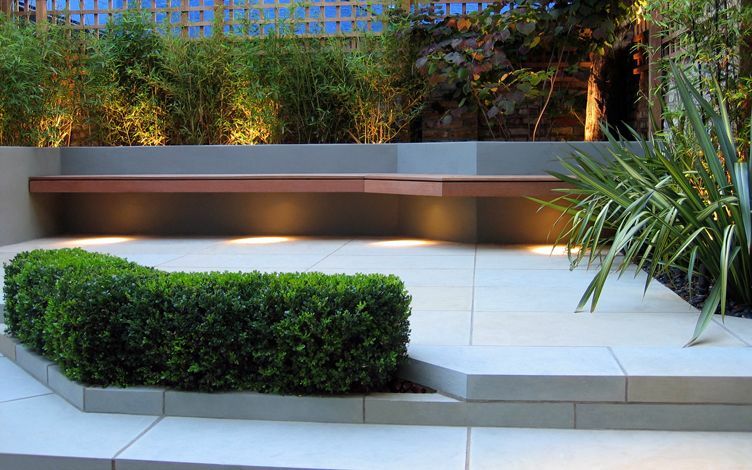 We joined the blue pavers together, creating seamless riser heights, while Box hedging follows the steps' angularity, producing a low textural barrier which adds movement, and distinguishes various seating zones. 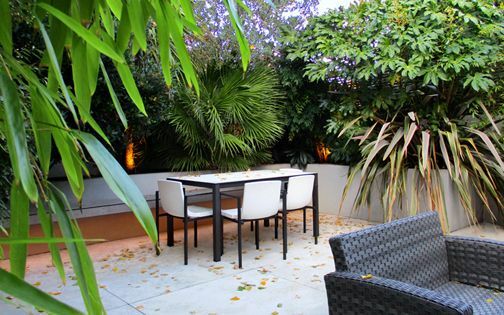 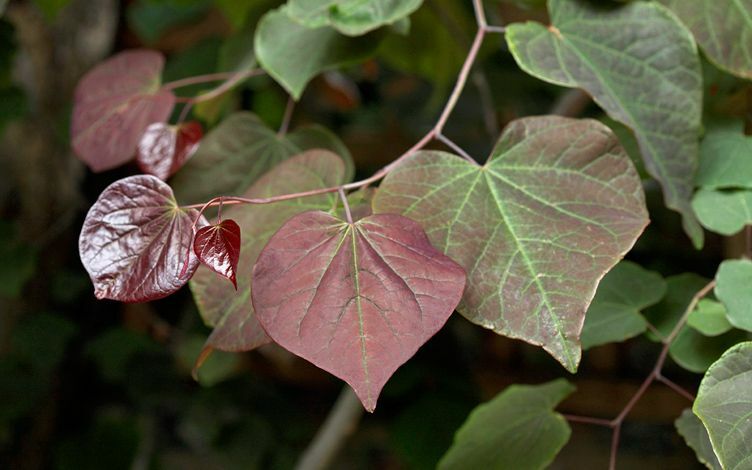 The dainty purple foliage of a Japanese maple, an Acer palmatum ‘Bloodgood’, is flawlessly defined above the light-toned sandstone, and is very much at home in a North London patio garden, where woodland trees thrive in a damp shaded microclimate, reminiscent of their native habitat. 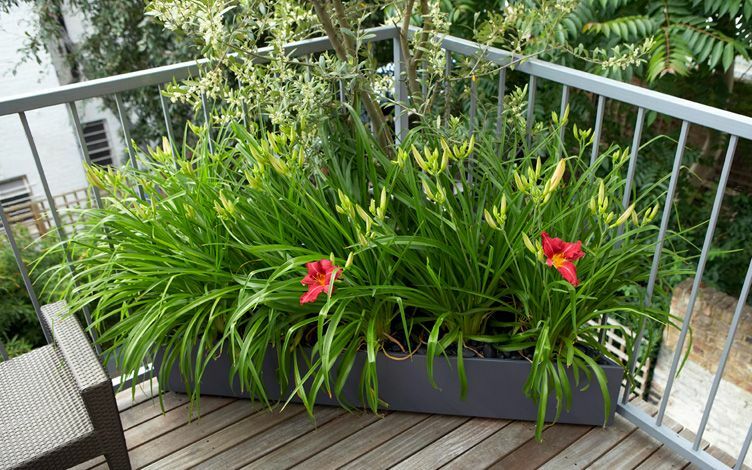 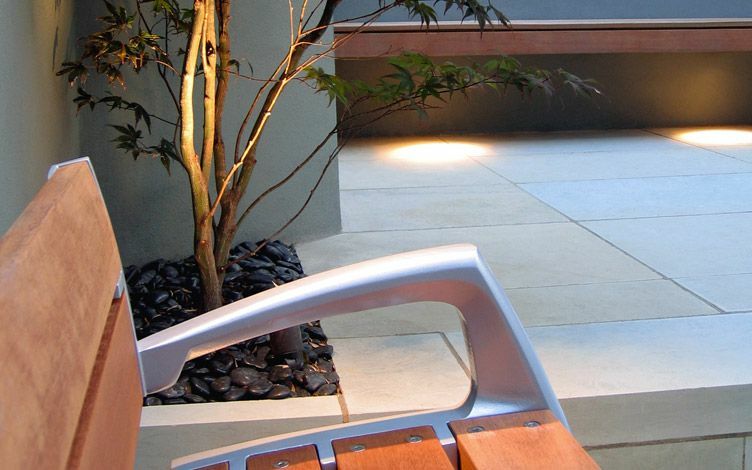 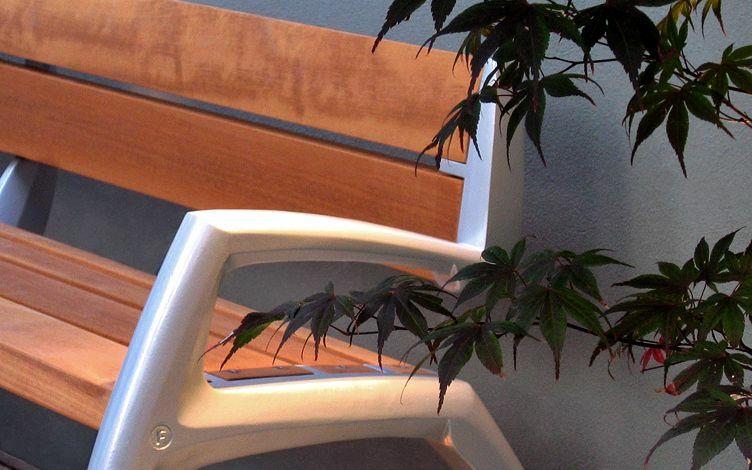 A 4-metre cantilevered bench is angled to the patio outline in three sections. 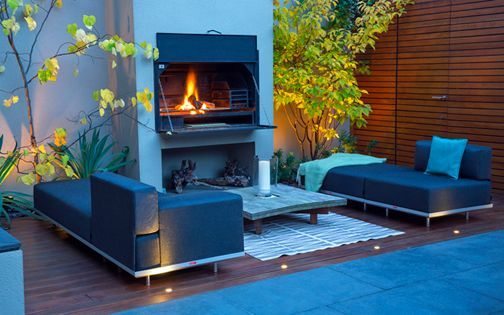 A light yet robust metal framework was designed and built into its raised bed, as we progressed, clad in hardwood to match the decked patio. 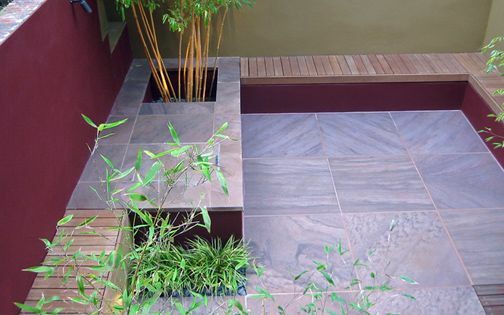 The high bed wasn't backfilled with earth, to conserve a native Hawthorn, where a subtle environmental approach generates captivating synergy, as Bamboo canes emerge from a lower, inverted base. 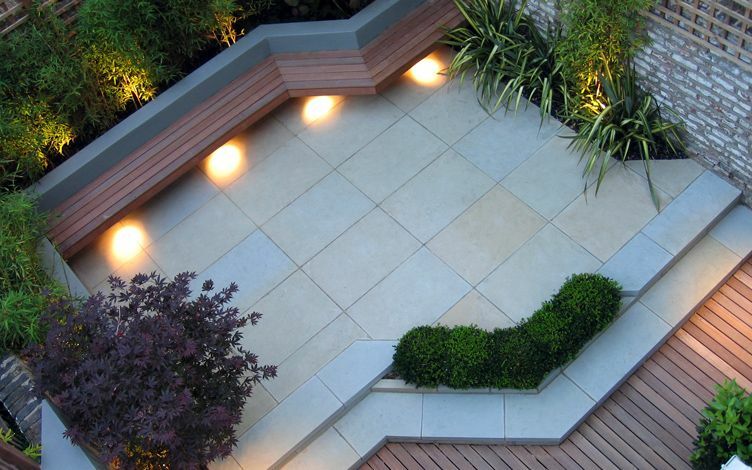 This inventive technique evolved while designing level changes in a Shoreditch patio, where similar site parameters required design ingenuity and landscaping resourcefulness. 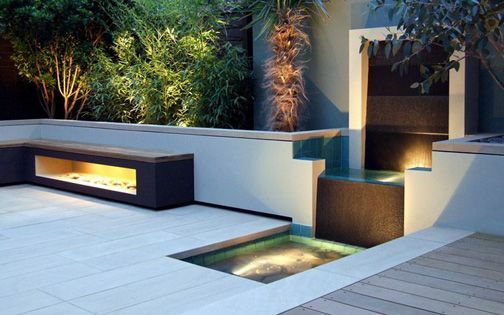 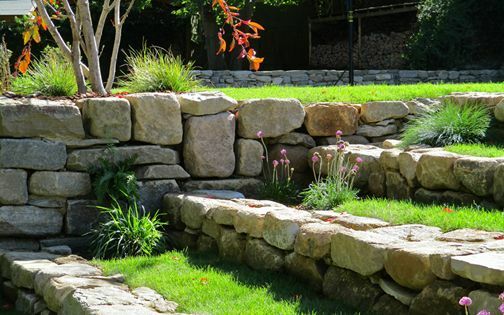 When designing a compact outdoor space, each amplified niche and cavity consolidates spatial depth, formed by the interplay of shadows and light which produces distinctive ambience in a small contemporary garden. 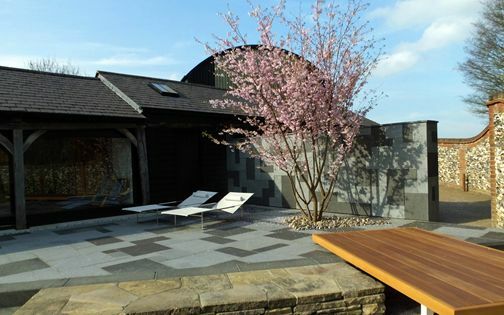 The reshaped level change generated effective, directional geometry and a dynamic view from the home's upper floors, carving out further valuable entertainment space. 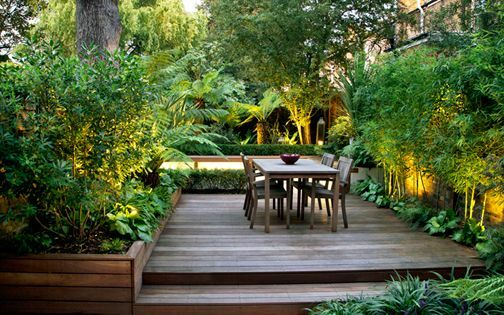 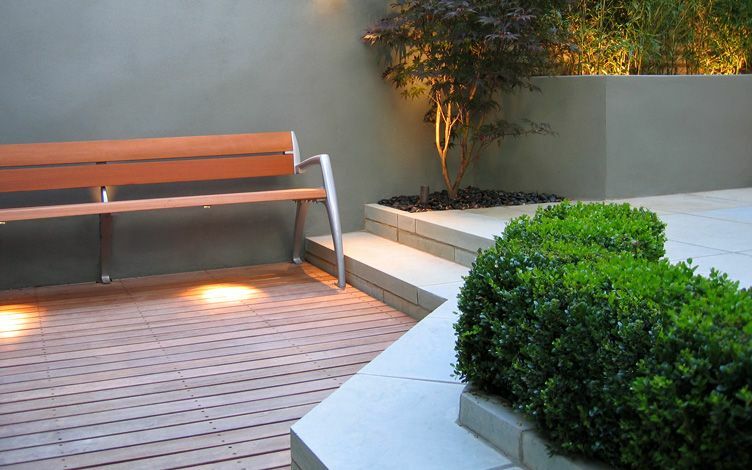 Three methods of outdoor seating were designed to maximise alfresco living, where a free-standing bench is positioned at the lower patio with a full garden perspective, while a cantilevered bench defines a central focal point, providing plentiful informal seating – augmented by a round dining set. 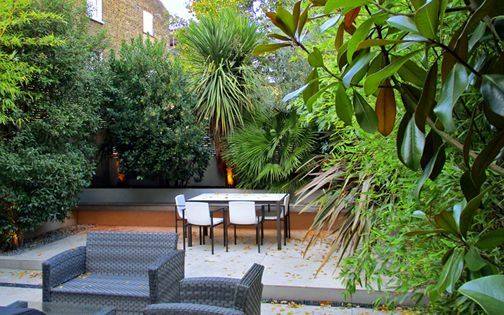 Our clients' eye for detail and fiercely pragmatic approach was delineated by a fresh continuum of garden design ideas originated for this comprehensive renovation project, and in conserving the Hawthorn tree, the native flora enhances distinctiveness, and sustains a design congruous with the ambience and wildlife of a Primrose Hill shaded garden. 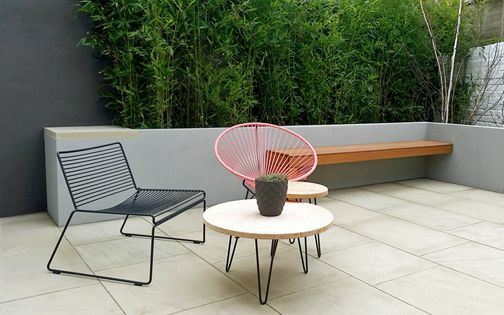 In this Primrose Hill residence, the landscaping sequence and its multitude of patio design ideas, spanning the frontage, back garden and rooftop terrace, forms a pivotal function. 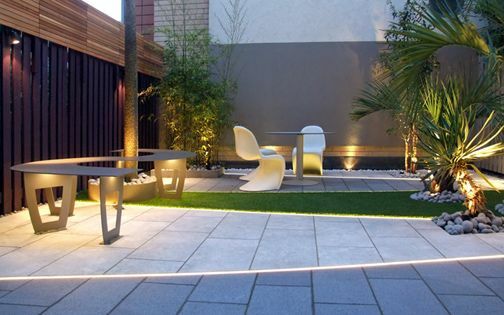 Redesigning this patio garden transformed an underused, dreary outdoor patch of grass into a peaceful, secluded sanctuary, where exterior space is utilised by all family members, augmented by the lofty vantage point of a new roof terrace. 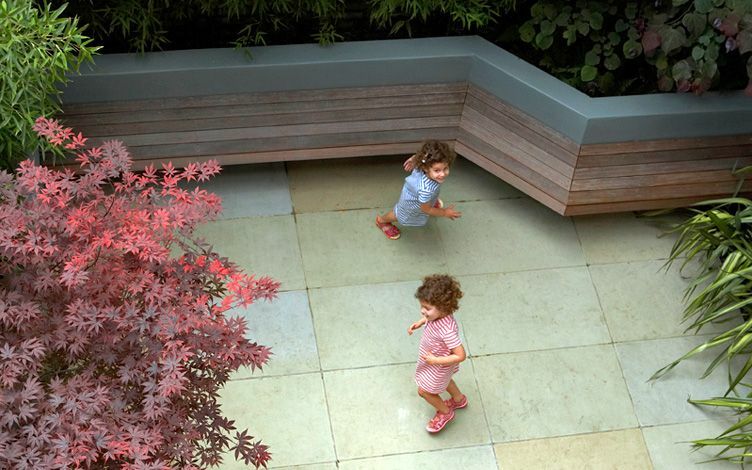 The bench's floating detail adds fresh geometry, producing a fun play area for the kids above renewed topography, defined through boldly relocating the patio steps and extending useful alfresco use. 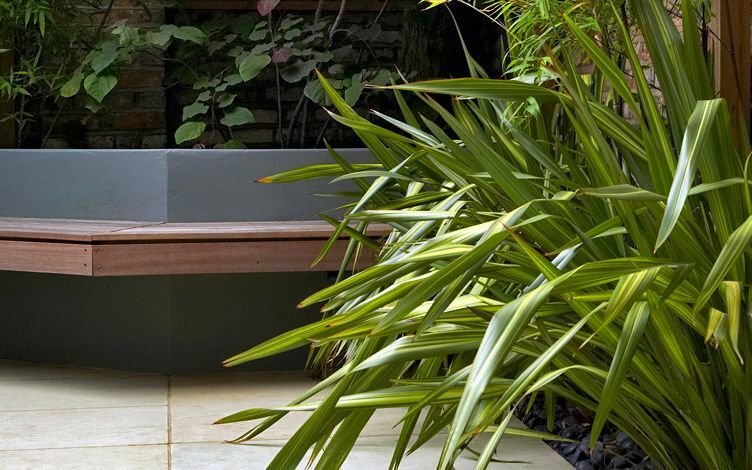 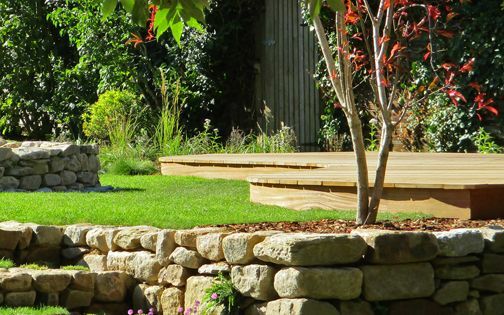 By maximising precious outdoor space, and improving visual context, we created a compelling, contemporary small courtyard garden design for the entire family and their guests to dwell in all year round.